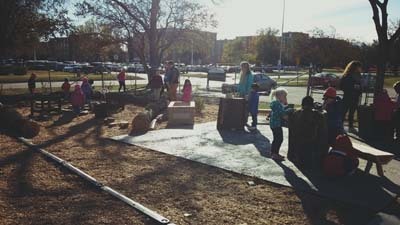 Welcome to the University Children’s Learning Center (UCLC) Preschool Outdoor Classroom. It is a big name for a big project that surpassed our wildest dreams. 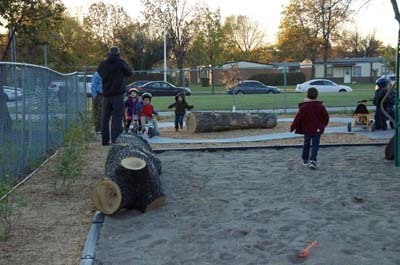 We began with a fairly typical preschool playground. 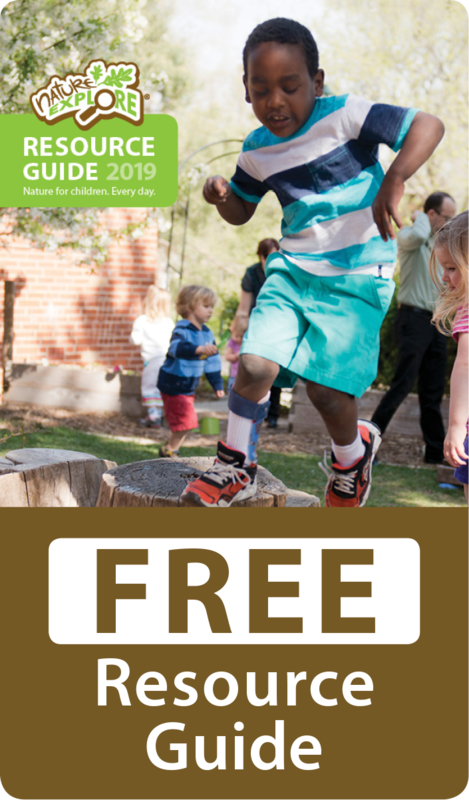 We had a big metal swing set that 4 children could use, a large grassy hill, lots of sand around a climbing structure and a couple of small planting boxes. Then some very vision-forward teachers and the director began to dream about an Outdoor Classroom. 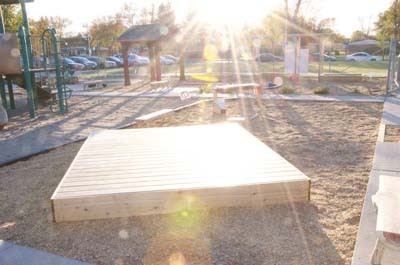 Four parents: Kallie Naastad, KariJo O’Keefe, Katy Johnson and Stacey Borboa-Peterson envisioned the description of this amazing outdoor space and began fundraising. They ignited the parents and many community members (way too many to name here) who agreed that the children at UCLC would benefit from this Outdoor Classroom. In a little over a month, they raised the dollars and in-kind donations of labor to break ground. Now, when you walk into the UCLC Outdoor Classroom, you enter a true classroom. There is an area where children and teachers can gather to talk about what they want to do. 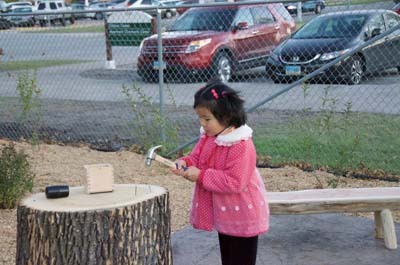 They can choose to go to the art area and paint on the large double sided easel, or they can draw a picture while standing at the table, which just happens to be a very large tree stump! Or they may choose to go the sand area to dig. If they aren’t in the mood for digging, they can go to the building area. 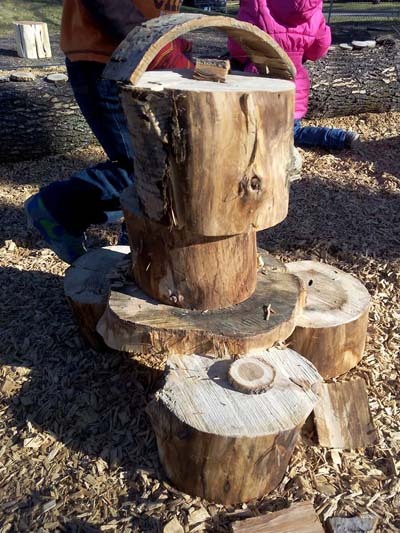 There the children find 3 large tree stumps that were meant to act as a table for their building creations but right now, the children are working hard to pound nails into those stumps. Off to the right of this area is the climbing structure from before and also a new “racetrack” where children ride their wheeled toys. In the center of the racetrack is a log for climbing on, over and walking along. Several of our young budding musicians love the Marimba, located right next to the stage in the Music Area. They use their voices, the cactus shakers and drums while they move their bodies and enjoy the music they create. 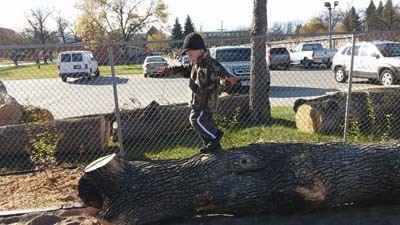 UCLC had a generous donation of logs that act as a boundary around the messy/loose parts area. This area has an abundance of tree cookies (some purchased ones along with many donated ones), large wooden blocks and smaller building materials. We also still have our grassy hill for lots of movement. It includes a couple of logs for walking along and stumps for climbing over.